At number two in the list was the famous Bachelor’s Grove Cemetery Ghost. 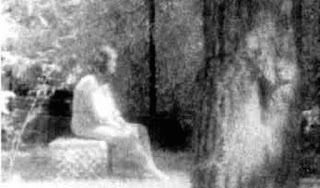 A photo that was taken by Judy Huff-Felz in 1991 that appears to show a forlorn looking lady sat on a tombstone and dressed in old-fashioned clothing with parts of her appearing to be transparent. The photograph has received worldwide attention, in particular on the internet as being one of the most credible ghost pictures ever taken. So you can imagine my excitement when a gentleman emailed me saying he was a close relative of Judy and was I interested in hearing the real story behind the famous photograph. In the late 1980’s Judy and her sister joined a paranormal research group called the Ghost Research Society founded by a man named Dale Kaczmarek. 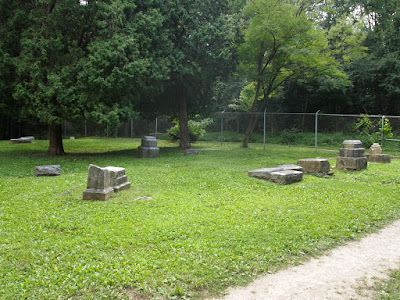 The Society planned a trip to Bachelor’s Grove Cemetery for the fall of 1991. A place that was believed to be a paranormal hot spot. The graves there date back to 1834. The cemetery also lies just off a highway dating back to the 1920’s that is now closed. 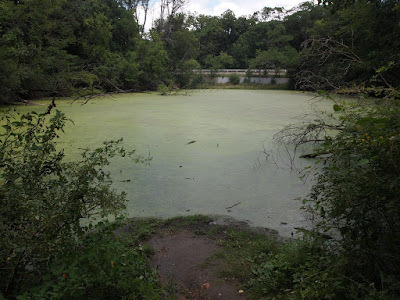 It is reported that organised crime families from the prohibition era used the highway, the cemetery, and it’s adjacent lagoon for executions and body dumping. Police found several bodies and firearms in the lagoon the cemetery sits next to. 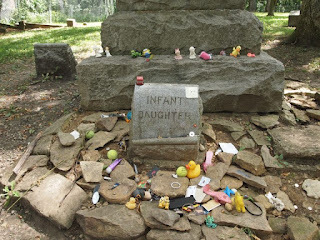 In the 1960’s and 1970’s, the cemetery saw severe grave desecration. Headstones were destroyed, thrown into the lagoon, and coffins were dug up. In the 1960’s there were verified reports of cult rituals being performed at the cemetery, rituals that included animal sacrifice and animal remains have been found at the cemetery by police on several occasions. A farmer’s horse and wagon became lodged in the lagoon sometime in the 1800’s. The farmer drowned attempting to free his horse of the wagon, resulting in the horse drowning as well. The cemetery has become a pilgrimage for vandals, Satanists, the occult, and paranormal enthusiasts. The last time I was there – the fall of 2015 – there were fresh candles and flowers at a large family plot. There is a headstone labelled “Infant Daughter” and it is typically the site of pilgrimage, with those wishing to pay respects decorating the family plot and her grave. The camera used by Judy to take the photo was an Olympus automatic 35mm telephoto, using 35mm infrared film. After every picture taken, the camera would wind the film inside to the next frame automatically. Because of this design, it was impossible to double expose the film. After the photo was taken, it took a week to receive the developed photos back from the shop. Upon the discovery of the woman, Dale Kaczmarek proceeded to conduct an investigation with Eastman Kodak on both the negative and the print to authenticate it. Kodak was able to confirm that the woman was present in both the negative and the print, that double exposure was not possible with the configuration of the camera, and that it had not been doctored to their knowledge. All of this ruled out that the photo was altered during or post development. Which means that if it were faked, there would have had to be an actual person sitting on the headstone in front of the camera. Which, though possible, would be difficult due to the fact that the woman appears to be slightly translucent. Supposedly, to minimize any sort of interference, only one Ghost Research Society member was allowed into the cemetery at a time, with Judy being the only one present at the time of its taking. In 2015, Zak Bagans of the television show Ghost Adventures contacted Judy. He flew her out to Las Vegas, Nevada to interview her for an episode of his show Ghost Adventures: Aftershocks. For the sake of the show, he reportedly paid a senior expert in Photoshop $25,000 USD to authenticate the photo. The conclusion reached was that there was not technology available in 1991 to fake the photo, as well as that a negative can not be photoshopped, with the woman already confirmed to be on the negative. He was also able to verify that the negative was from 1991, substantiating the two prior claims. The episode aired on January 2nd, 2016. It is still available to watch here is the link. Zak Bagans also offered to purchase the original negative from Judy for his paranormal museum in Las Vegas. Judy declined. In my personal opinion, though skeptical as I have always been regarding the paranormal, I believe it to be genuine. Judy is not rich or famous from the photo, and she has not benefited from it monetarily in any way. Our two families are not of a significant financial status. If anyone could have benefited from it in any way, it would be Judy and her children. But she never has. Likewise, 1991 is now 26 years past. Typically in that time, someone will step forward to disclose hoaxes. Because there is no monetary gain from it, and no disclosure of its faking in 26 years, I have allowed to let myself believe it is authentic. I have also taken some photo’s of the area as it is today, these were taken on 12th August 2017. I don’t know what I believe about the photo and ghosts in general. But I do know that Judy is not a crazy person, nor has she ever benefited from the photo’s existence in any way. I don’t know if it is a ghost in the photo, but I know it is not a scam. Becoming a member of their family has generally made me believe it to be entirely authentic, no matter how much I want to deny it on the grounds of fact versus fiction. I would like to personally thank this gentleman for providing me and the Top5s Community with such detailed information, I find the account absolutely fascinating and would like to thank him so much for taking the time to tell the real story of this world famous photograph and really appreciate the detail and the effort he has taken to explain everything.